Magic Johnson was selected first overall in the 1979 NBA Draft by the Lakers. He won a championship and an NBA Finals Most Valuable Player Award in his rookie season, and won four more championships with the Lakers during the 1980s. Johnson's career achievements include three NBA MVP Awards, nine NBA Finals appearances, twelve All-Star games, and ten All-NBA First and Second Team nominations. He led the league in regular-season assists four times, and is the NBA's all-time leader in assists per game, with an average of 11.2. Johnson was a member of the "Dream Team", the U.S. basketball team that won the Olympic gold medal in 1992. 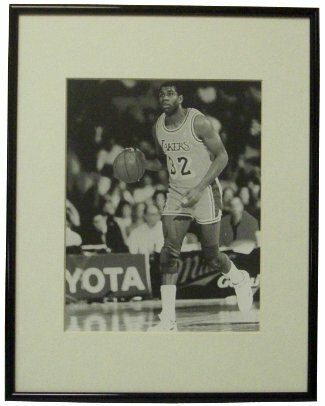 This is an unsigned Los Angeles Lakers B&W 8x10 Photo of Magic Johnson, Custom Matted and Black Metal Framed.